UNITED NATIONS, Jun 21 2016 (IPS) - Nearly 10 years after UN members adopted a progressive Convention on the Rights of Persons with Disabilities (CRPD), progress implementing the convention has been mixed, even at the UN itself, say disability advocates. Last week the 165 member states that are party to the convention met at the UN to review implementation and elect members of the committee of experts with disabilities which provides advice on the convention. The elections last week brought about two firsts for the committee, including the first deaf sign language user elected to the committee, and the first person with an intellectual disability elected to the committee. However, many also expressed alarm that the 18 member committee will only have one female member from the beginning of 2017. “I’m here today because I managed to go to school with the inclusive education, so inclusiveness is needed starting in education, employment (and) in the community." -- Mark Mapemba. Reyes said that the six women who were currently members of the committee had been making good progress working on projects for the inclusion of women and girls with disabilities, and that she hoped that the new committee would continue this work but acknowledged that it would be difficult with only one woman represented. Priscille Geiser, Chair of the International Disability and Development Consortium (IDDC) said that although some qualified women candidates were put forward and not elected, the elections also reflected the additional challenges that women with disabilities face, making it difficult for them to gain nomination from their home countries. Martin told journalists that he would work alongside persons with psychosocial disabilities since the two groups often faced similar challenges. “I really believe in closing all institutions down because they are archaic, they are from the 18th century and they are not from the 21st century,” added Martin. However there were concerns that some meetings held at the UN last week did not adequately involve persons with disabilities or consider all of the aspects of the human rights approach as reflected in the Convention. Salam Gomez, Co-chair of the World Network of Users and Survivors of Psychiatry (WNUSP) told IPS that the conference was overly focused on issues of mental health, without also addressing the other needs of people with psychosocial disabilities such as education and employment. “It used to be very normal that psychiatrists would be the ones who would talk about us but now that is changing,” added Jolijn Santegoeds, who co-chairs the WNUSP with Gomez. Like other disability groups, those with psychosocial and intellectual disabilities want to ensure that the conventions commitment to the full human rights of persons with disabilities is respected. Mark Mapemba, from the disability organisation PODCAM in Malawi and Inclusion International, told IPS about the importance of inclusiveness in his home country. “I’m here today because I managed to go to school with the inclusive education, so inclusiveness is needed starting in education, employment (and) in the community,” he said. Vladimir Cuk, Executive Director of the International Disability Alliance, told IPS that the concept of “nothing about us, without us” is “at the heart” of the CRPD. The alliance is made up of organisations from around the world whose members are persons with disabilities. 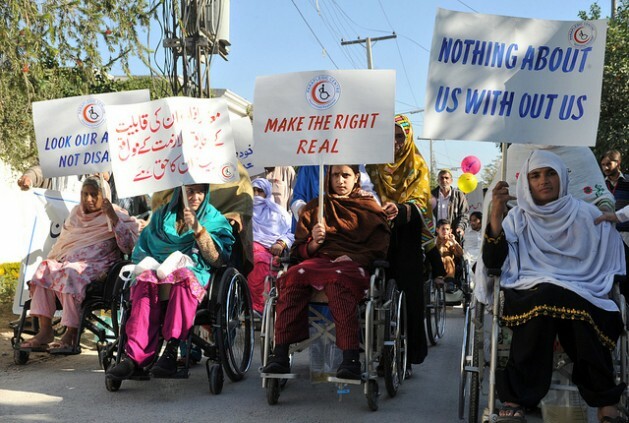 Cuk said that despite the importance of consulting with persons with disabilities noted in the convention, there has been a trend towards disabled persons organisations being consulted less by the UN. “We are the best experts about people with disabilities, this has to be taken into consideration, so discrimination happens when we are not there and that’s why ‘nothing about us, without us’, is so critical for us,” he said. While the new committee is representative of persons with a diverse range of disabilities, Collin Allen, the incoming Chair of the International Disability Alliance also noted that it would present some challenges for the UN. “Although it certainly marks a new era for the committee, I think there will certainly be enormous challenges for the UN system to see how they can accommodate the participation of all those members of that committee with their various disabilities, to make sure the procedures are accessible, to recognise the diversity of the needs of people with disabilities to operate on an equal level,” he said.